Add real-time clock capabilities to micro:bit with the Kitronik RTC Board. Create clocks & other time functionality for micro:bit projects. MakeCode compatible. If you haven't yet got the time for your BBC microbit projects, the Kitronik RTC Board has come to the rescue! 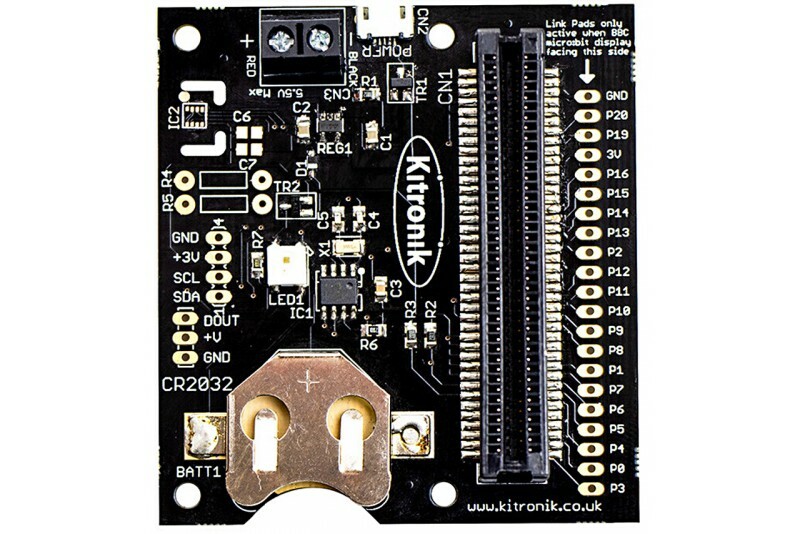 Add Real Time Clock capabilities to the BBC micro:bit with the Kitronik RTC Board. You can use it to create clocks or to add time functionality to your micro:bit projects. The board produces a regulated 3V supply that is fed into the edge connector to power the inserted BBC micro:bit, removing the need to power the BBC micro:bit directly. The coin cell holder allows a CR2032 battery to power the real time clock to continue keeping time whilst there is no mains power being supplied to the board and BBC micro:bit. Power to the board can be supplied either via the Terminal blocks or the boards USB connector. Note: This USB connector is only for power supply and not for data transfer. The micro:bit RTC also has an expansion port for adding additional I2C devices with a 3V supply (for example, an OLED display), and another for extra ZIP LEDs (for example, a ZIP Sticks). Kitronik have added custom blocks for the RTC board to the Microsoft MakeCode editor. The blocks can be added to the editor by; clicking the cog in the top right of the editor. Then select 'Add Package' from the drop down menu. This will open a dialog box with a search field, type Kitronik into the search field. This will bring all of our custom block sets, scroll down to the RTC blocks and select them. The blocks will now be added to your menu and can be used in your programs. Add Real Time Clock capabilities to the BBC micro:bit. The coincell battery ensures that the RTC board continues to keep time when the board is not connected to a power source. It features and expansion port for 3v I2C devices, such as an OLED display or ZIP LEDs. Write code using the MakeCode Editor. Code with ease, courtesy of the custom blocks that have added to the MakeCode Editor. When the RTC board is powered, it will also power the inserted microbit. 1 x Kitronik RTC Board.